Van Halen is an American rock band formed in Pasadena, California. In 1972 the Van Halen brothers, Eddie and Alex, formed a band called Mammoth which featured Eddie as lead vocalist/guitarist and Alex on drums. After recruiting David Lee Roth as lead vocalist and Michael Anthony as bassist and backing vocalist, the band changed its name to Van Halen. Van Halen played clubs in Pasadena and in Hollywood during the mid-1970s, consistently playing at well-known clubs like the Sunset Strip and the Whisky a Go Go. In 1977, Mo Ostin and Ted Templeman of Warner Bros. Records saw Van Halen perform at the Starwood in Hollywood and offered them a recording contract. Van Halen is the band’s debut studio album. Using Sunset Sound Recorders studio from mid September to early October 1977, the band recorded the guitar parts in one week and the vocals in two additional weeks. All of the tracks of Van Halen were laid down with little over-dubbing or double tracking. Minor mistakes were purposely left on the record and a simple musical set-up was used to give the record a live feel. Despite its simple components, Van Halen proved innovative in musical technique, production, and arrangement. On release, Van Halen reached #19 on the Billboard pop music charts, one of rock’s most commercially successful debuts. It is a highly regarded heavy metal and hard rock album. The album included songs now regarded as Van Halen classics, like ‘Runnin’ with the Devil’, ‘Ain’t Talkin’ ‘Bout Love’, and ‘Jamie’s Crying’. Eddie Van Halen set a new standard for guitar playing and spawned a generation of players utilizing his unique style and approach. The instrumental track, ‘Eruption’, an arpeggio-glissando-feedback-drenched guitar solo, showcased Eddie’s use of hammer-ons and pull offs, and his mastery of tapping, the use of the right hand to activate and fret notes along with the left. The sheer blazing delivery and solid composition shocked the guitar world and instantly set him apart as one of rock’s premier guitar virtuosos. The album cover was shot at the Whisky a Go Go. The guitar pictured on the cover of the album is Edward Van Halen’s famous Frankenstrat Guitar, made from a neck purchased from Boogie Bodies and a Stratocaster style body custom made by Wayne Charvel in California and assembled in Edward’s parents’ garage. The band toured for nearly a year to promote the album, establishing a reputation for their electric performances. The band’s chemistry owed much to Eddie Van Halen’s technical guitar wizardry and David Lee Roth’s flamboyant stage antics. Van Halen was released in February 1978 and sold over 10 million copies in the US alone, becoming one of the most successful debuts by a hard rock band. 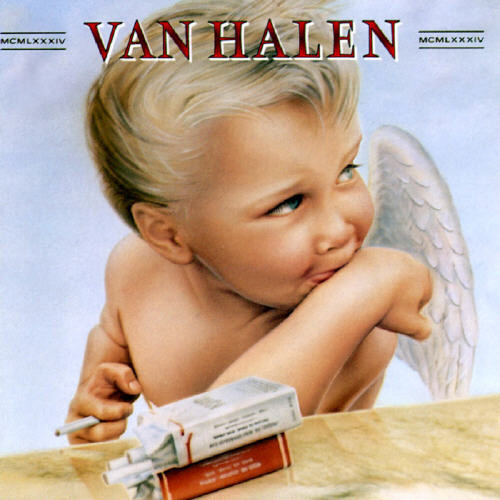 Along with 1984, it gives Van Halen two original albums with Diamond status in sales. In 2003, the album was ranked number 415 on Rolling Stone magazine’s list of the 500 greatest albums of all time. All songs are written by Alex Van Halen, Edward Van Halen, Michael Anthony and David Lee Roth unless otherwise stated. 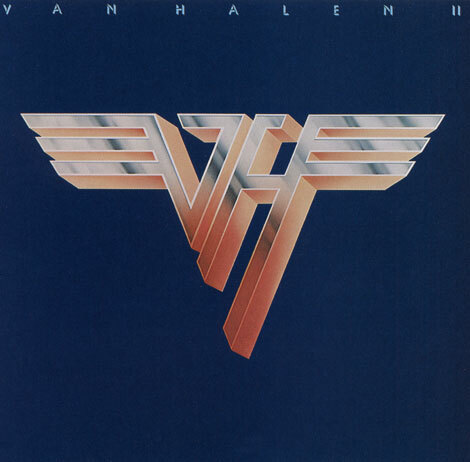 Van Halen II is Van Halen’s second album, released in 1979. The band returned to the studio in 1979 to record Van Halen II, similar in style to their debut. This album yielded the band’s first hit single, ‘Dance the Night Away’. The actual recording of the album took place less than a year after the release of their eponymous debut album. Many of the songs on this album have been known to exist prior to the release of the first album, and are present (in various forms) on demos recorded in 1976 by Gene Simmons and in 1977 by Ted Templeman, including an early version of ‘Beautiful Girls’ and ‘Somebody Get Me a Doctor’. 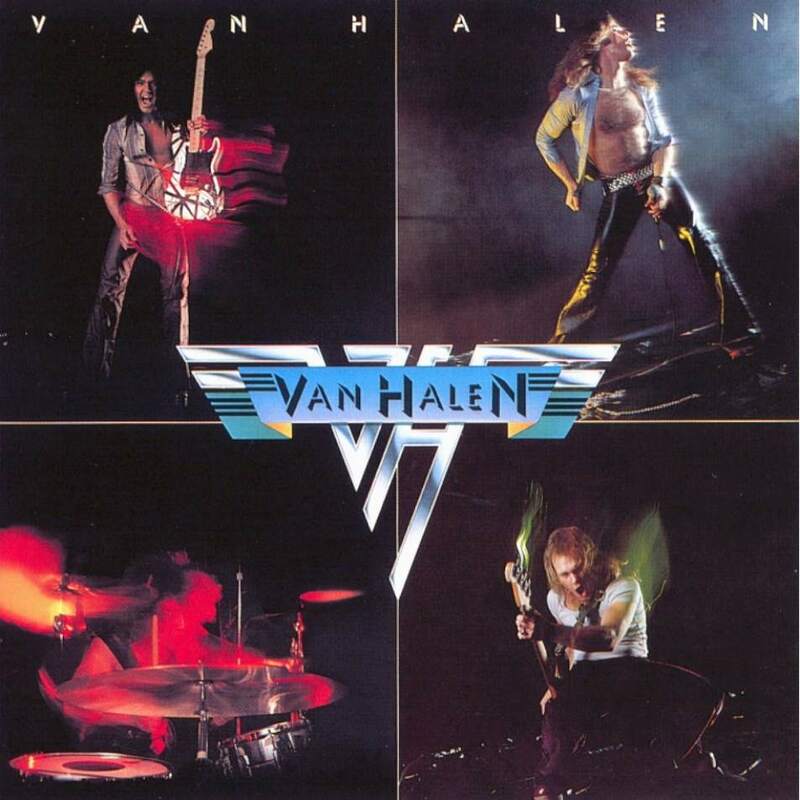 The black and yellow guitar on the back of the album is not actually used on the Van Halen II album; as it had only been completed just in time for the photo shoots for the second album. David Lee Roth is shown in a cast in the inner liner notes, as he allegedly broke his heel making the leap on the back cover. All songs, except where noted, are written by Edward Van Halen, Alex Van Halen, Michael Anthony, and David Lee Roth. 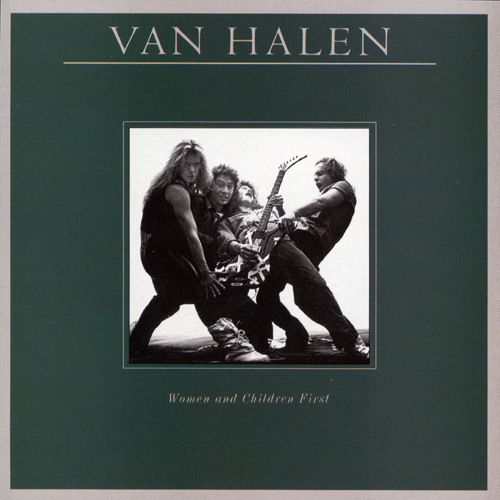 Women and Children First is Van Halen’s third studio album. Released in 1980, Women and Children First continues the trends laid out on the first two albums, relying on the vocals of David Lee Roth and the guitar playing of Eddie Van Halen. 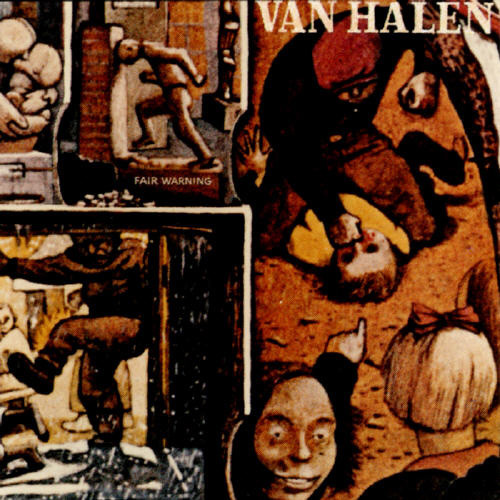 This is the first Van Halen album to feature all original band compositions. The opening track, ‘And the Cradle Will Rock…’, begins with what sounds like guitar chords, but is, in fact, a phase shifter-effected Wurlitzer electric piano played through Van Halen’s 1960’s model 100-watt Marshall Plexi amplifier. ‘Could This Be Magic’? contains the only female backing vocal ever recorded for a Van Halen song — Nicolette Larson sings during some of the choruses. The rain sound in the background is not an effect. It was raining outside, and they decided to record the sound in stereo using two Neuman KM84 microphones, and add it to the track. Only one single was released from the album, the keyboard driven ‘And the Cradle Will Rock…’ Although the single was not a success like the previous singles ‘Dance the Night Away’ or the cover of ‘You Really Got Me’, the album itself was well received and further entrenched the band as a popular concert draw. The song ‘Everybody Wants Some! !’ was also a concert staple through the 1984 tour, and continued to be played by David Lee Roth after he left Van Halen. The album contains a hidden track at the end of ‘In a Simple Rhyme’, a brief instrumental piece entitled ‘Growth’. All songs are by Michael Anthony, David Lee Roth, Edward Van Halen and Alex Van Halen. Fair Warning is Van Halen’s fourth studio album. Released in 1981, Fair Warning went double platinum, which means it was a substantial hit, but still the band’s slowest-selling album of the David Lee Roth era. The front cover art features a detail from The Maze, a painting by the Canadian artist William Kurelek. The album’s cover artwork is accompanied by an insert of a black and white picture of the band, as well as a view of a ghetto drywall. This drywall has a wire running across it, cracked windows at the top and a Roth-era Van Halen logo with plaster cracked over the left wing. Also on the wall is the lyric ‘And someone said Fair Warning. Lord will strike that poor boy down. Turned from hunted into hunter. Went to hunt somebody down,’ which is from the album’s opening song, ‘Mean Street’. 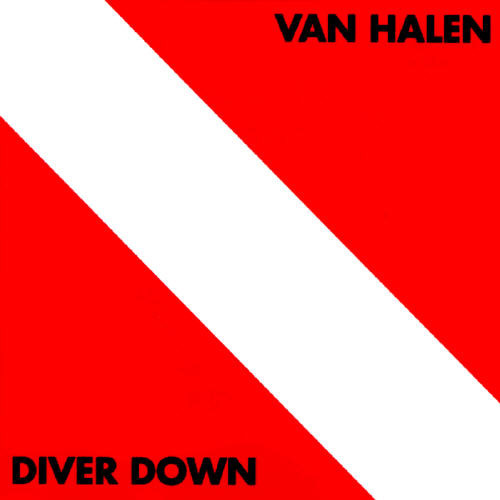 Diver Down is Van Halen’s fifth studio album. Released in 1982, Diver Down spent 65 weeks on the US album charts and had, by 1998, sold 4 million copies in the United States. Five of the twelve songs on Diver Down are covers, the most popular being the cover of ‘Oh, Pretty Woman,’ a cover of a Roy Orbison song. At the time, the record company thought they had a greater chance of a hit record if it comprised songs that were already successful. In retrospect, it turned out to be one of the Van Halen brothers’ least favorite albums with Eddie stating: ‘I’d rather have a bomb with one of my own songs than a hit with someone else’s’. In addition to this, two of the original songs were around long before the album was made. ‘Hang ‘Em High’ can trace its roots back to the band’s 1977 demos. ‘Cathedral’ was also nothing new, being played in its current form throughout 1981 with earlier versions going back to 1980. Additionally, ‘Happy Trails’ had been recorded for their 1977 demos as a joke. All songs are by Michael Anthony, David Lee Roth, Edward Van Halen and Alex Van Halen, except where noted. 1984 (written as MCMLXXXIV ) is Van Halen’s sixth studio album. One of the band’s more popular albums (in terms of both record sales and chart performance), 1984 is the final album featuring singer David Lee Roth before he left the band in the spring of the following year. Eddie Van Halen, well-known for his guitar prowess but also a classically-trained pianist, used 1984 as an opportunity to take the band into different territory. Additionally, 1984 was the first Van Halen album to be recorded at Eddie Van Halen’s home studio, 5150. Eddie Van Halen’s keyboard playing is more prominent on 1984 than on any prior Van Halen album, particularly on the songs ‘Jump’, ‘I’ll Wait’ and instrumental album-opener ‘1984’. The title track ‘1984’ is a short synthesizer and effects instrumental (the effects had been used as part of Michael Anthony’s live bass solo on the Diver Down tour); ‘Girl Gone Bad’ contained parts which had previously been played during the same tour; the hard rock songs ‘Drop Dead Legs’ and ‘Top Jimmy’ were tributes to James Paul Koncek of the band Top Jimmy & The Rhythm Pigs. The album concludes with ‘House of Pain’, a fast-paced heavy song that dates back to the band’s early club days of the mid ’70s. The engine noise heard during ‘Panama’ was from Eddie revving up his Lamborghini; microphones were used near the tailpipes. Eddie claims to have written the arrangement for ‘Jump’ years before the album was recorded, and is evidenced in a 1982 interview where he played it over the phone. Roth said he came up with the lyric because it was leap year, and because he saw a man on television wanting to commit suicide by jumping off a building. 1984 peaked at #2 on the Billboard Magazine album charts (#1 at the time was Thriller, which featured an Eddie Van Halen guitar solo on ‘Beat It’) and contained future hits ‘Jump’, ‘Panama’, ‘I’ll Wait’, and ‘Hot for Teacher’. ‘Jump’ reached #1 on the magazine’s singles chart. 1984 is the second of two Van Halen albums to have sold 10 million copies in the United States. Note: The album’s original release credits all songs to Edward Van Halen, Alex Van Halen, Michael Anthony and David Lee Roth.The label on the UK single release for ‘I’ll Wait’ credited Michael McDonald as a co-writer, but he was not credited on the U.S. version of the single. That’s it for the story and discography of this particular Van Halen line-up. Eddie, Dave and Alex – augmented by Eddie’s son Wolfie on bass – are back in the studio, recording a new album. It’s not the original Van Halen line-up, but it’s as close as it can be. 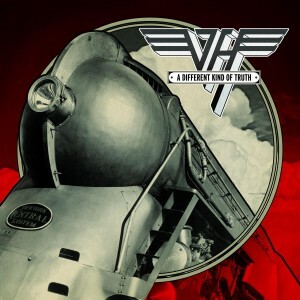 A Different Kind of Truth is the twelfth studio album by Van Halen, released on February 7, 2012 on Interscope Records. Produced by both the band and John Shanks, it is Van Halen’s first studio album since reuniting with lead vocalist David Lee Roth in 2007, and the first to feature bassist Wolfgang Van Halen. This is the band’s first album in fourteen years. The first single from the album, “Tattoo”, was released on January 10, 2012. One day after its release to iTunes, it was the #1 selling rock song in the US, Canada, Finland and the Netherlands, while charting in Sweden, Belgium, Germany and the UK. It received over two million YouTube hits in its first week of release and over four million to date. By January 23, 2012, “Tattoo” was ranked #1 on Billboard’s Hard Rock Singles chart, the #1 most played song at classic rock radio in its first week and #1 most added song at mainstream and active rock radio. The songs on A Different Kind of Truth were described by Roth as “a sort of collaboration with [Van Halen’s] past.” Seven tracks that appear on the album are based on material which Roth notes, “Eddie and I generated, literally, in 1975, 1976, and 1977.” 1970’s demo versions exist of what became “She’s the Woman”, “Outta Space”, “Big River”, “Beats Workin'”, “Tattoo”, “Honeybabysweetiedoll”, and “Bullethead”. Five songs on A Different Kind of Truth are brand new Van Halen compositions. “Stay Frosty” and “You and Your Blues” feature both musical and lyrical nods to the blues. Lyrical themes on the album are diverse; however, a majority of songs deal with cyclical successes, failures, and fate, in an intricate but generally tongue-in-cheek style.Such lyrical themes are present on “She’s the Woman”, “China Town”, “Blood and Fire”, “Bullethead”, “As Is”, “The Trouble with Never”, “Stay Frosty”, and “Beats Workin'”. A Different Kind of Truth is the first David Lee Roth-fronted Van Halen studio album not to include an instrumental as a stand-alone track. All lyrics written by David Lee Roth, all music composed by Van Halen.